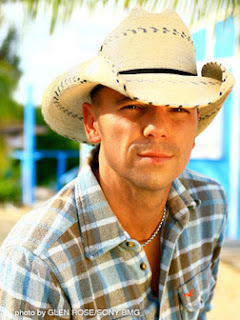 The gradual migration of the music of Kenny Chesney from the heartland of his Tennessee upbringing to the tropical climes of an offshore existence has long been a topic for discussion. Perhaps now with no streak of CMA awards to maintain and the opportunity to set his own agenda, the hugely successful country superstar can continue to go about re-defining his sound. This is very much in hybrid mode as while there are strong undertones of a Caribbean influence in LIFE ON A ROCK, some of the more explicit offerings do not really define the album. In particular this refers to the ‘Spread Love’ track where Chesney has decamped into an alternative world to record, with The Wailers and Elan Atias, an unabated attempt to re-create a soft reggae sound. While it will certainly polarise the country music fraternity, the positive laid-back vibes generated are in sync with many of the other songs which have a more conventional back porch feel to them. There is a greater subtleness to an extended Caribbean sound with a hint of steel drum faintly adorning his full on tributes to the little introduction needed ‘Marley’ and his late colleague Kristi Hansen in album closer ‘Happy on the Hey Now (A Song for Kristi)’. While this album is defined by an easygoing style centred round uncomplicated acoustic strumming there is still room for a little bit of amplification that exists in parts of the two opening tracks. The heavily promoted single ‘Pirate Flag’ which partially documents his migration south opens the album, with the second track ‘When I See this Bar’ reflecting a little on some of the diverse aspects of settling into a new way of life. Having had a writing input into most of the album’s ten tracks, Chesney demonstrates his ability to clearly convey to pen his thoughts and observations of life, as expertly done in the simple but effective slow burner ‘Lindy’. This occurs later in the album with the title track ‘Life on a Rock’ where by now the sound has allowed a little more home country rock to amalgamate with the island beat. The track ‘It’s That Time of Day’ is probably the best example of a fused sound where country meets the Caribbean with a satisfying feel good atmosphere being generated by Chesney and his assembled musicians. Of course, Kenny Chesney is not the first country artist to experiment in Caribbean roots music and he drew on the experience of Willie Nelson to duet on ‘Coconut Tree’. Nelson, now in his 80th year, delved into the reggae world for his 2005 album COUNTRYMAN and the little ditty he contributed to on this album had all the stamp of one of America’s musical legends over it. Perhaps this is something Chesney can aspire to achieve in the second half of his career now that all the record sales and money are in the bank. Some fine conventional guitar work which veers a little towards a blues direction opens the remaining track, the co-write with long time collaborator Mac McAnnally ‘Must Be Something I Missed’. 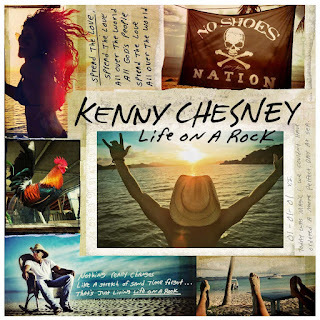 In essence this sums the album up as Chesney is not afraid to go on an exploratory journey while still having that innate ability to produce a commercial piece of work that will support his live summer extravaganzas around US sports stadiums. Investing a small amount of your valuable listening time in LIFE ON THE ROCK will not go without its rewards. If by any chance we get the summer the UK deserves, the relevance of the vibes of this record will soar.